Colombian food? Dive right in! 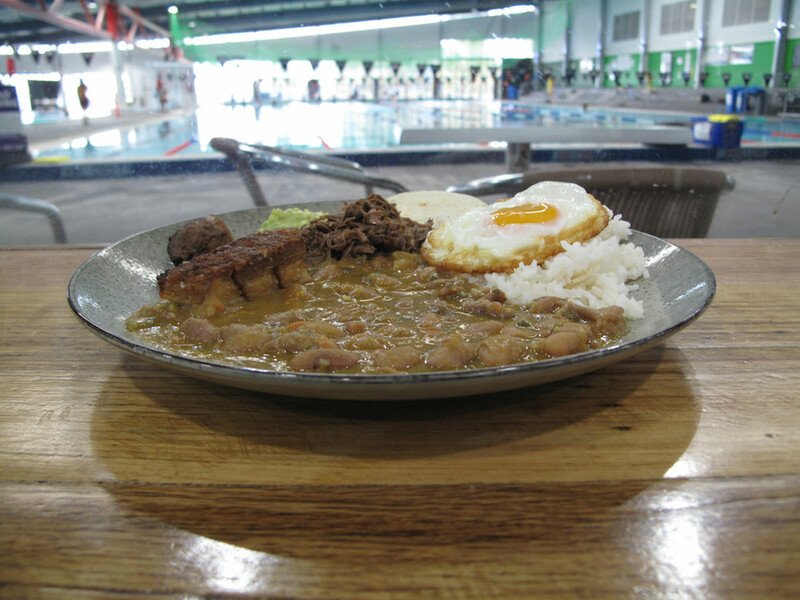 You won’t want to go swimming for a few hours after eating bandeja paisa at El Toucan Cafe. 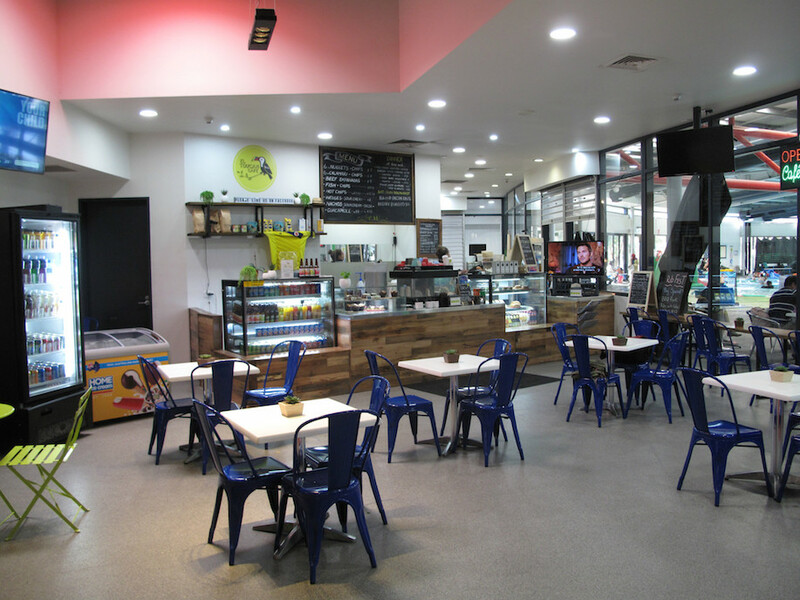 But should you so desire, the facilities couldn’t be closer at hand – El Toucan is located right in Maribyrnong Aquatic Centre, its seating gazing out upon the various swimming pools. I could opine that this is western weirdness personified, but really how unusual is it when CTS and its friends not only keep an open mind about where we may find great food, but also do so regularly in quirky locations? But this is most definitely the kind of adventure that sets the hearts of myself and CTS pal Nat Stockley into a cheerful gallop. El Toucan boss Frank Torres keeps the likes of chicken nuggets and burgers on his menu. As he says, this IS a swimming pool operation and he DOES want to stay in business. But he’s very proud to be offering a range of true-blue Colombian dishes. It’s to these we are drawn, as are the tables surrounding us inhabited by Colombian families. 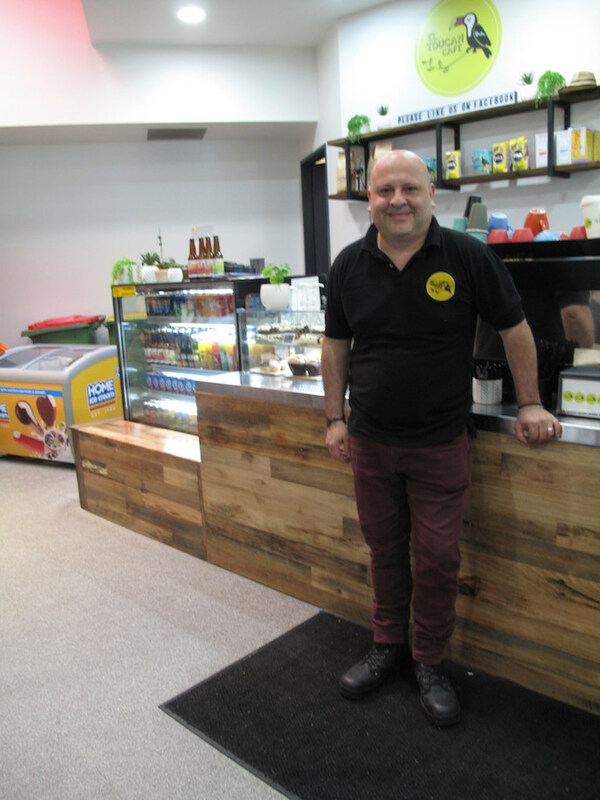 Frank is a Melbourne eatery veteran, having in years past run the likes of El Dorado Grill in the CBD. 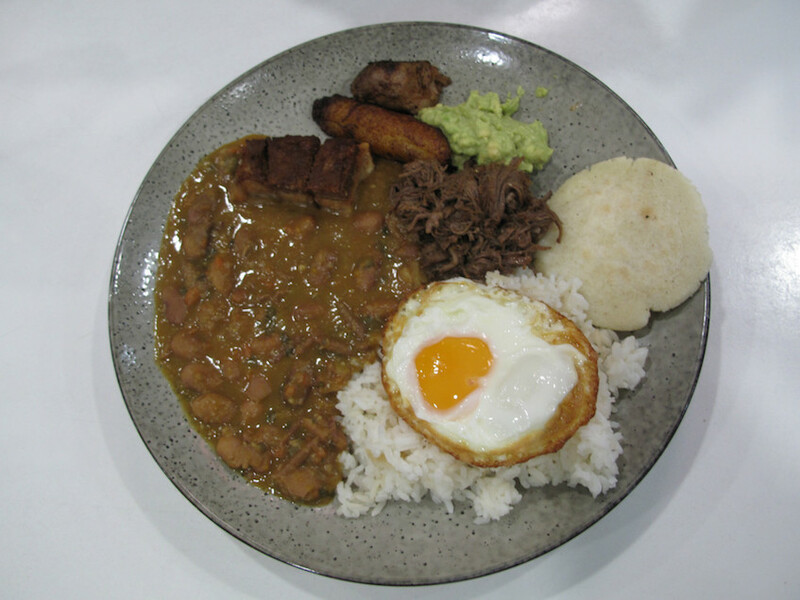 Bandeja paisa is something of an informal Colombia national dish. Frank tells us its roots lie in its evolution as a hearty lunch for early-starting, hard-working coffee growers – which makes it the equivalent of your typical, full-bore Aussie/Kiwi shearers’ spread. 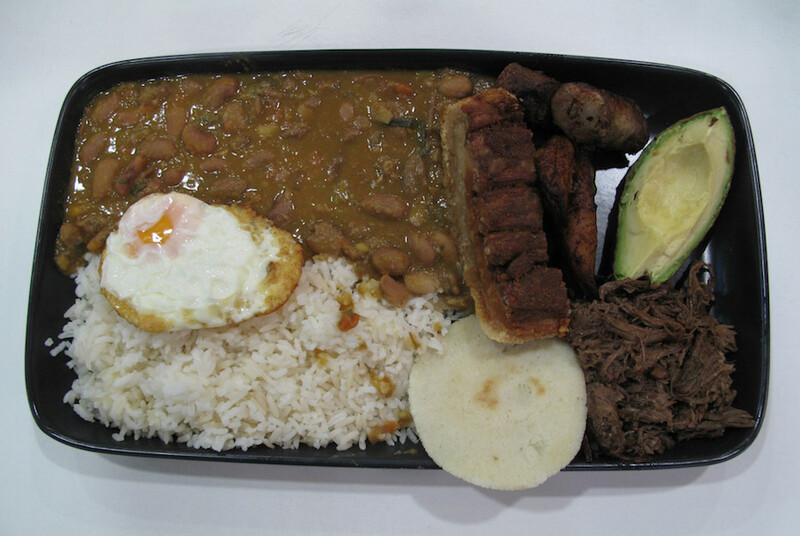 Nat goes the full bandeja paisa – a huge meal and something of a bargain at $20. I opt for the half serve – it’s not listed anywhere, but is available on request. Even it is a substantial meal and also a bargain at $12. Expertly fried egg and rice. Superbly creamy beans and fried ripe plantain. And meat – pork belly, chorizo and pulled beef that would match it with any barbecue joint. The pork belly, as we’ve come to know of South American food, is well cooked, but as delicious as everything else on our plates. Empanadas con yuca ($9) are also outstanding. 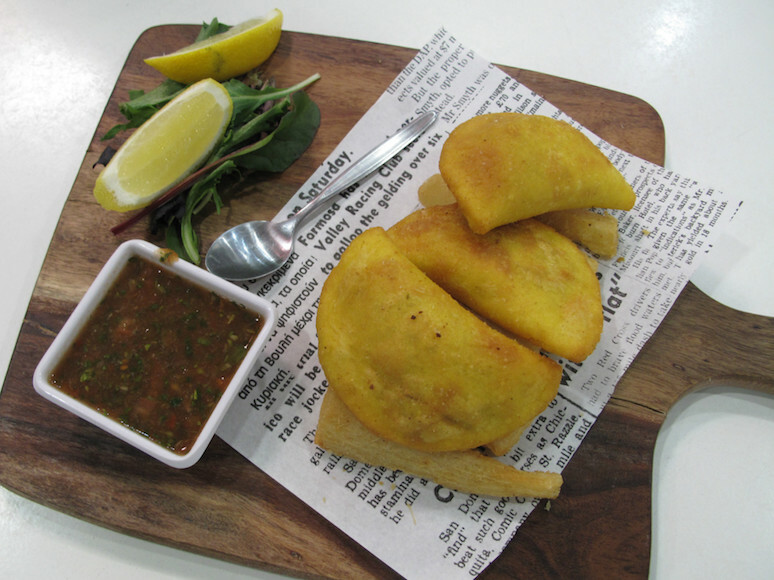 The three empanadas are made with corn meal, the casings stuffed with beef mince and deep fried. They are joined by cassava chips that are fluffy and lovely. On the side is a bowl of aji – a salsa-like dipping concoction. This dish could constitute a cool and very cheap light meal for those not up to El Toucan’s more full-on offerings. On an earlier, reconnaissance visit, I enjoyed sobrebarriga ($22) of slow-cooked beef skirt served with rice, avocado, cassava and sofrito. This, too, is a hefty and excellent meal. 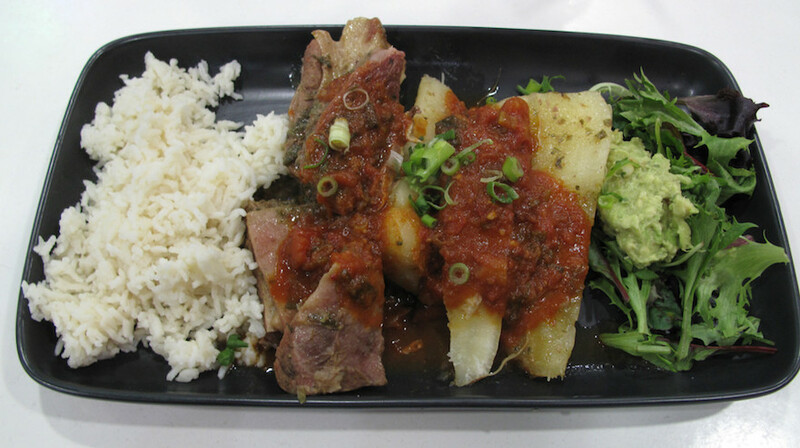 Though, in contrast to our other selections, in this case the meat is very tender and the cassava – playing the roast potato role – dryish and a little too starchy for my tastes. On the day we visit there’s a liver dish on, while a few folks around us are enjoying what look like very good pork ribs – even if, as Frank maintains, they are less specifically Colombian than the likes of bandeja paisa. Other dishes mentioned on the cafe’s Facebook page include patacón con carne o pollo (fried plantain fritter with shredded chicken), fried snapper, lamb skewers with kale slaw and pulled beef quesadilla. Important note: For those wanting to try the El Toucan cooking without making use of the centre’s other facilities, there is no admission charge. Winter hours for El Toucan Cafe are Monday-Friday 9am-8.30pm and Saturday-Sunday 9am-6pm. Thanks to Nat “Punster” Stockley for the intro! Looks very interesting. What a shame MAC wasn’t designed so there was an indoor/outdoor interface for this sort of thing…cafes, areas for the birthday parties, etc, to take full advantage of opportunities available. Hope it does well there. Hi Wendi! Well, Frank has tried to imbue the space with some personality – but it is what it. 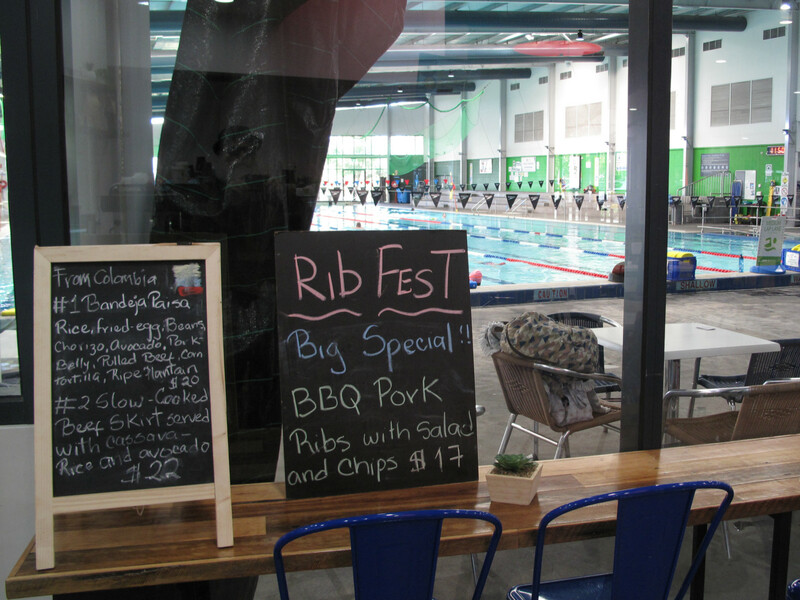 No matter – I dare say it has the best food of any swim centre/gym/whatever in the west. And quite possibly in the entire know universe. Yeah. I went with what was on the blackboard! I was thinking the same thing Juz – something I’ve learned about this year from my now-regular acquaintance with Eatmesoulfood (a local business that does cheap, hearty meal delivery in Maidstone and surrounds – often with a South American bent, like home made arepas and tortillas; or this week’s chicken soup with plaintain, cassava, aji); but also things like korean pork; vegan curries, etc. Worth checking out if you haven’t heard the good word. I’ve seen EMSF advertising on Facebook but since I really enjoy cooking I don’t think I’ll be ordering. Not to say their food doesn’t look appealing. 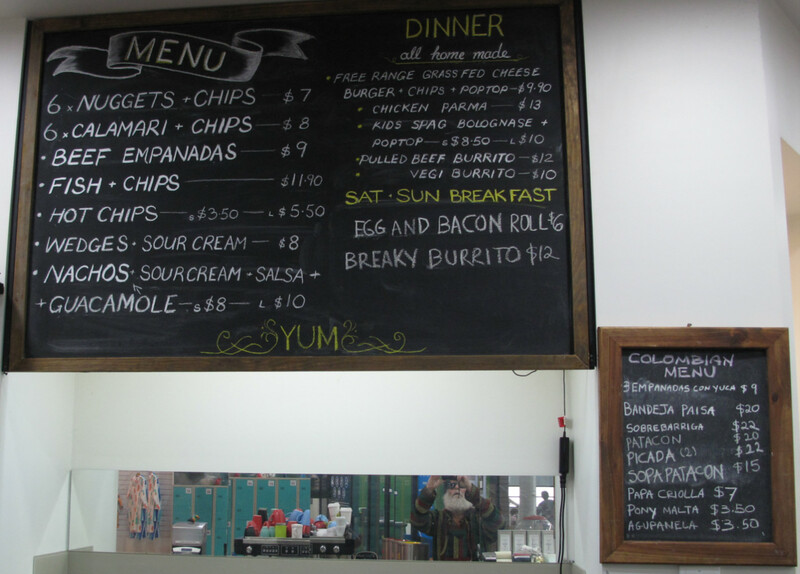 As a side note… I noticed the other week that the Euro deli at Footscray Market has a great range of arepas and tortillas. Quite amazing actually. Including the La Tortilliera ones, and very fresh thy were too.